Shutterbox Photobooth is a company that provides photo booth rentals and staff for events, such as weddings, corporate conventions and company holidays, trade shows and festivals – for starters. Brandon Bieber doesn’t see any limit to the possibilities of his service. Shutterbox was started in Chicago in 2008 and brought to Milwaukee by Bieber. “A friend of mine started the company and built the first booth,” says Bieber, who went to school for finance and never thought entertainment was something he’d get into. Bieber, who grew up in the Chicago suburbs, says that after he saw how much people were enjoying Shutterbox there, he knew he had to get involved. A cousin living in Wauwatosa also encouraged him to bring Shutterbox to the Milwaukee area. “Milwaukee was a no brainer. This is our third wedding season in Wisconsin,” says Bieber, who has lived in Wauwatosa, near his cousin and her husband, since May 2010. Shutterbox’s first Milwaukee event was Green Bay Packers player Al Harris’ charity soiree at Mo’s Steak House in November 2009 (coincidentally, the same month Harris was cut by the Packers). Weddings are still the bread and butter for Shutterbox; its photo booth photos make fine keepsakes and party favors, one’s that Bieber says people don’t leave behind on the reception tables. August through October are the high period for weddings and Shutterbox is booked almost every Saturday. Bieber is also making Shutterbox’s presence felt in lots of other venues, including the Brewers Wives charity mixer at StoneFire Pizza in New Berlin, where for a $5 donation people can take a photo in the Shutterbox booth with one of the 12 players who will be there. Bieber also recently spent four days at Northwestern Mutual’s company convention at the Frontier Airlines Center, where his photo booth was incorporated into an overall golf theme: company employees and their family members put on traditional golf attire and held blow-up clubs for shots in the photo booth. Shutterbox will also be at the North Shore Bank “Taste of Lake Country” in Pewaukee July 27 and 28. North Shore pays Shutterbox’s fee and makes the photo booth available to everyone at the festival. “We charge by event, not by the photo,” says Bieber. Shutterbox has pre-set packages. The ones for weddings range from $700 to $1,600, depending on particulars of the event and the day. Bieber has 8-10 employees who work the events, too; hand-picked, “friendly” people who can manage the somewhat demanding pace with cheer. People stand up in the Shutterbox photo booth for their photos. The booths accommodate between two and 10 people – up to seven most comfortably – and 12 people is the record. Bieber and his crew guide people into the booths, where there’s a screen that shows people where they are in the camera’s frame. There’s a blue button for color photos and a white button for black and white photos. “From the time people step into the booth to the time they walk away with their photos is about 30 seconds,” says Bieber. Bieber is currently running a special – $995 for the $1,200 package for events in 2013 – if people book by the end of this month. “Saturday is our biggest day and I encourage people to check availability early. 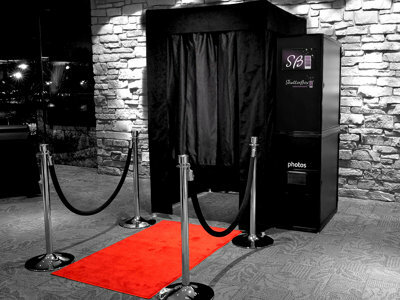 If they know they want a photo booth, it’s best to put in the deposit, even if the event is months away,” says Bieber. Bieber says there were only four other companies when Shutterbox started and maybe two more in Madison. Bieber says what’s unique about Shutterbox is its ability to drive people on the Internet with a quality website. He also says they work with any idea clients come up with. Even with the recession, Bieber says people are still putting money toward weddings. Communicating daily with other Shutterbox offices in Miami, Los Angeles Phoenix and Chicago, Bieber can speak pretty authoritatively on the current state of weddings.